A couple of months ago I was put on the school board at my son's school. Let me make something clear, right off the bat; I had no idea what I was getting myself into! I've been in more meetings over the last couple of months than I ever have. I also (gasp) had to buy a pair of dress pants. All I owned in my "pre-school board days" was yoga pants and jeans. What would a stay-at-home/scrapbooking mom need dress pants for? I learned all to quickly the answer to that question...school board meetings. Because I've spent so much time at the school and know a little more about what goes on "behind the scenes" I was more than happy to help with Teacher Appreciation Week. Because we were a little short handed and short on time we kept things simple and provided the staff with lunch and a gift basket with plenty of fruits, vegetables and a little taste of chocolate. A local produce company Provident Produce graciously provided us with boxes and boxes of yummy apples, bananas, cucumbers, peppers, strawberries, and grapefruit. I'm so grateful for their help! 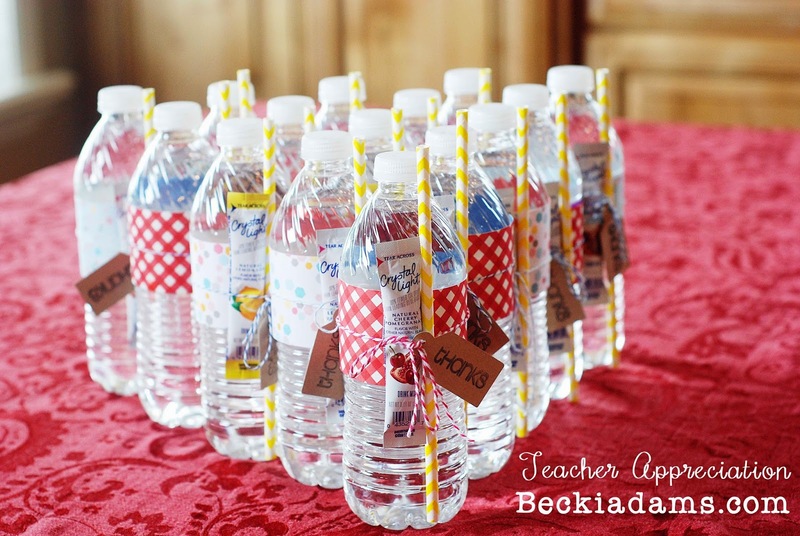 As a more crafty, personal touch I created these adorable water bottles for each teacher. Most of them were eating their lunch on the go so water bottles worked perfectly! The lunch turned out perfectly. It was so fun to visit with the teachers and get to know them a little bit better. I'm already thinking of Teacher Appreciation next year. What do you do for Teacher Appreciation week? I'd love to hear your ideas and pin a few more ideas so I'm better prepared next year.